More than 650 people are still trapped on Mount Rinjani on the popular Indonesian tourist island of Lombok. A popular tourist hotspot has left Hikers, mainly made up of tourists, are left stranded on the mountain following a devastating earthquake killed more than a dozen people. SO far reports of one fatality have already been confirmed, as one the hikers was struck by rocks and falling debris following the earthquake. A highly skilled rescue operation is currently underway for tourists caught in landslides on Mount Rinjani, an area popular with hiking enthusiasts. According to National Disaster Management Agency, 689 people are still trapped on and around the 12,224 ft mountain following the shallow 6.4-magnitude earthquake that struck on Sunday morning. At least 260 people had already been evacuated by Sunday afternoon, Sutopo said on Twitter, while a spokesman for Rinjani National Park said another 109 had been rescued as of 2 p.m. local time (8 a.m. GMT) Monday afternoon. 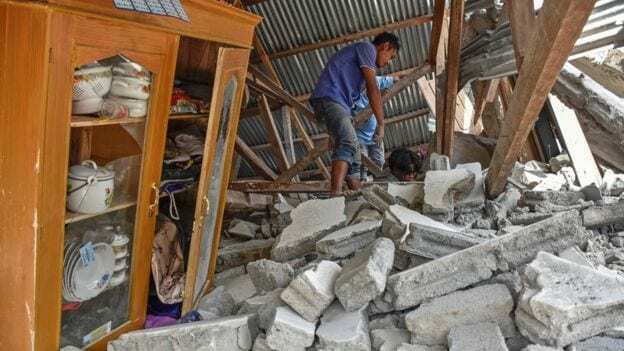 As of Monday afternoon, 15 people across the island have been reported dead following the earthquake, while another 162 have been reported injured, according to Indonesia’s National Disaster Management Agency. Reports from the ground in Indonesia are coming in sketchy; government officials are trying to demonstrate that the rescue efforts are under way and under control, however locals searching for their loved ones show a different side, devastated, panicked and scenes from the disaster showed locals picking through the rubble of their collapsed homes, and the injured hastily bundled into makeshift emergency shelters. The President has flown to area and is meeting with local communities and trying to reassure them, whilst handing out aid. As well government agencies who are trying to supply mineral water, tents and food supplies to the affected.